Greetings from the New England Conference of the First Episcopal District! 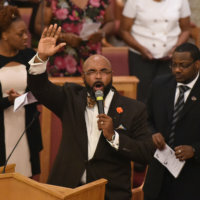 Our Conference consist of several local church congregations located throughout the States of Connecticut, Rhode Island and Massachusetts corporately defined as the Boston-Harford District. 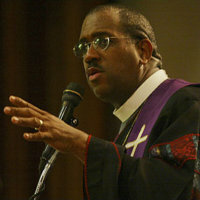 As the proud Presiding Elder of the New England Conference Boston-Harford District, it is an honor to extend this invitation on behalf of the many Pastors, Ministers, Lay Leaders and congregations of our various churches, welcoming you and your family to visit with us to experience the Awesomeness of God in one of the many multidimensional Praise and Worship Services held each and every Sunday morning in a community near you! We are pleased to be members of the many wonderful and culturally diverse New England communities and neighborhoods. The A.M.E. Church has been faithfully providing ministry and outreach programs and activities to serve multiple generations of people living in the cities, counties and towns within each of the States we serve for nearly 200 years. Our prayer is that we will have an opportunity to meet you and your family soon! Please enjoy visiting our Episcopal District website to learn more about our Church, the New England Conference and the various ministries we offer to serve men, women, boys and girls from all walks of life. God Bless You!